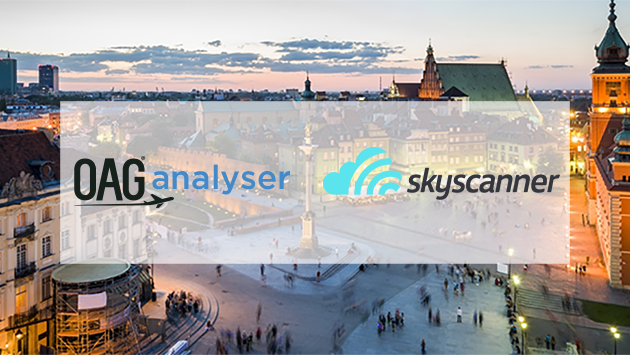 In the second collaborative piece, OAG and Skyscanner explore three trending destinations in Eastern Europe that could be interesting commercial opportunities: Sofia, Warsaw and Kiev. 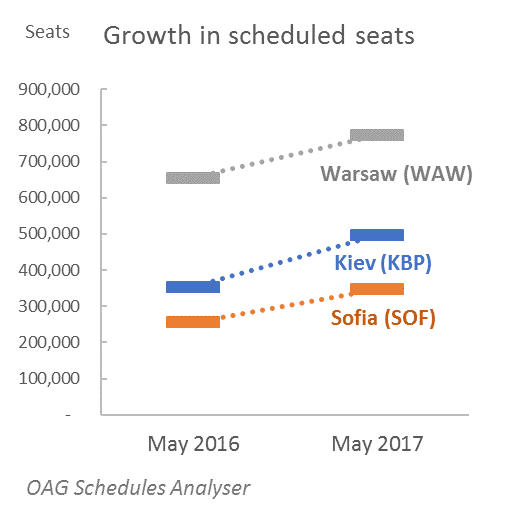 Between them, the key Polish, Ukrainian and Bulgarian airports of Warsaw, Kiev and Sofia have added almost 800 flights between last May and May 2017, according to OAG Schedules Analyser. This is a 17% increase in frequencies, accompanied by an 18% increase in seat capacity. 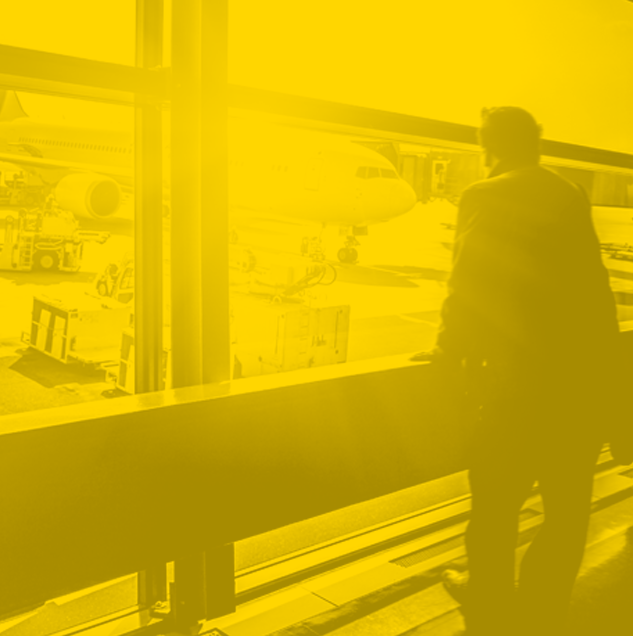 While new flights, especially from low cost airlines, stimulate interest from curious travellers about destinations, so too, their interest and the latent demand for travel in underserved markets is a beacon for airlines looking for opportunities to expand and develop air services. In Eastern Europe we see all of this. Ryanair and Wizz Air are expanding fast and some legacy carriers are looking to grow their networks. At the same time air traveller interest may never have been higher. This Bulgarian gem is steeped in history, and despite perhaps not being as well-known as a holiday destination compared to the country’s coastal beach or ski resorts, Sofia’s historic charm is starting to be noticed with a marked rise in searches. 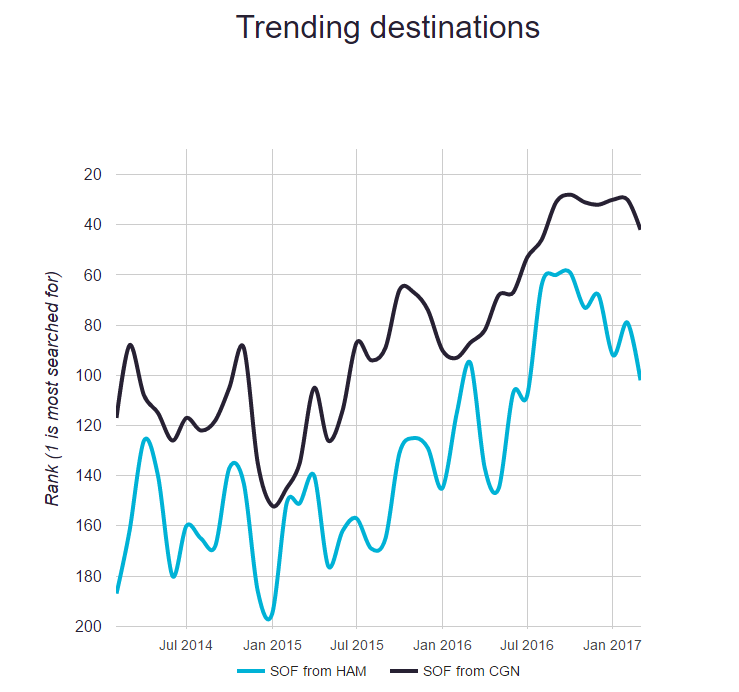 During 2016, there was a marked rise in popularity from three key regional UK airports to SOF, with the city rising up the trending destinations from Birmingham, Bristol and Glasgow. 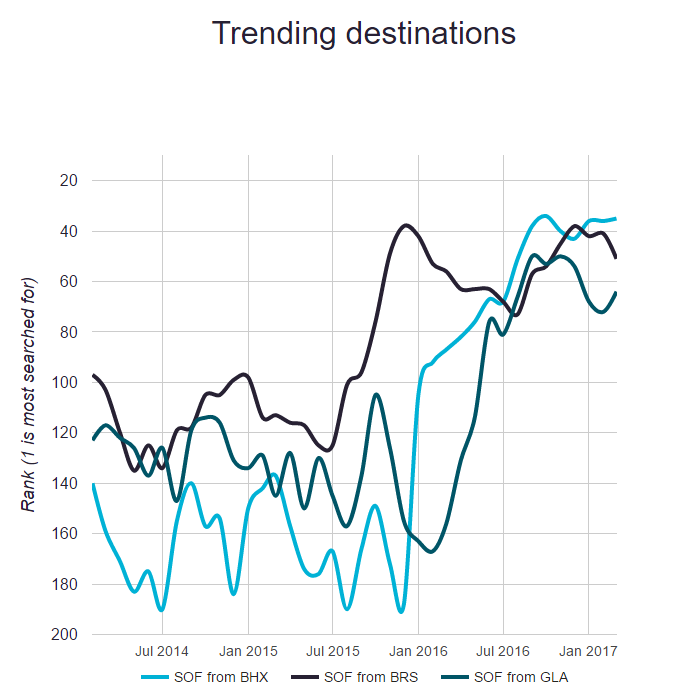 There trend line for Birmingham has been particularly striking; back in January of 2016, Sofia was only around 190 in the list of destination rankings, but has risen as high as 40th, a jump of around 150 places! This clearly corresponds to moves into each market by Wizz Air, Ryanair or both, as can be seen in OAG schedule data. Wizz began serving Sofia from Bristol in January 2016, and from Birmingham a couple of months later. Ryanair began to compete with Wizz into Birmingham from September 2016 and they now each offer three flights each weekly. Glasgow has also been a beneficiary of Ryanair service, with the carrier adding 2 flights a week to Sofia from September last year. 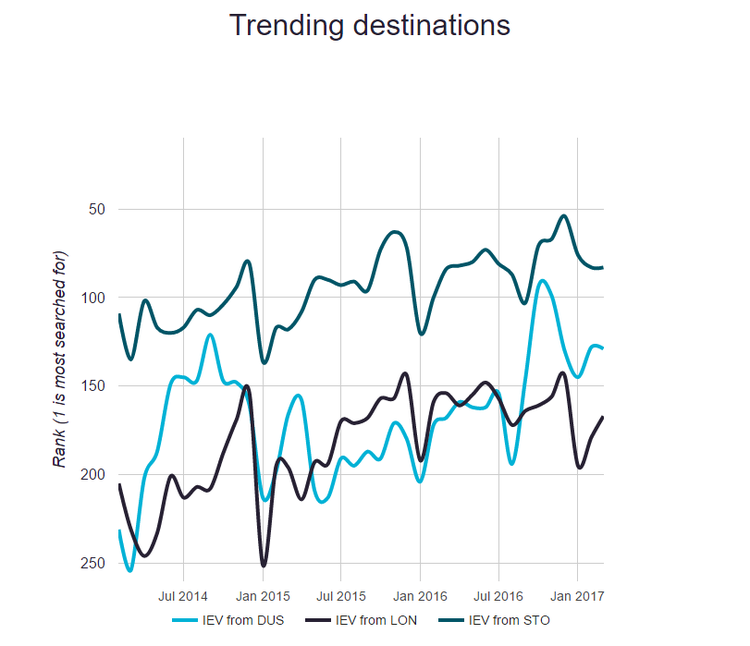 The destination has also been trending in Central Europe with a marked rise in searches from both Cologne and Hamburg over the last year. 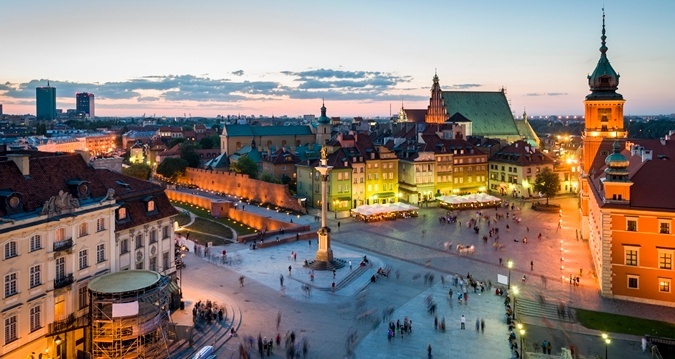 The fun-filled, diverse and lively city of Warsaw has been a firm favourite Eastern European destination for a while, but Skyscanner data suggests the city is still trending upward in popularity. 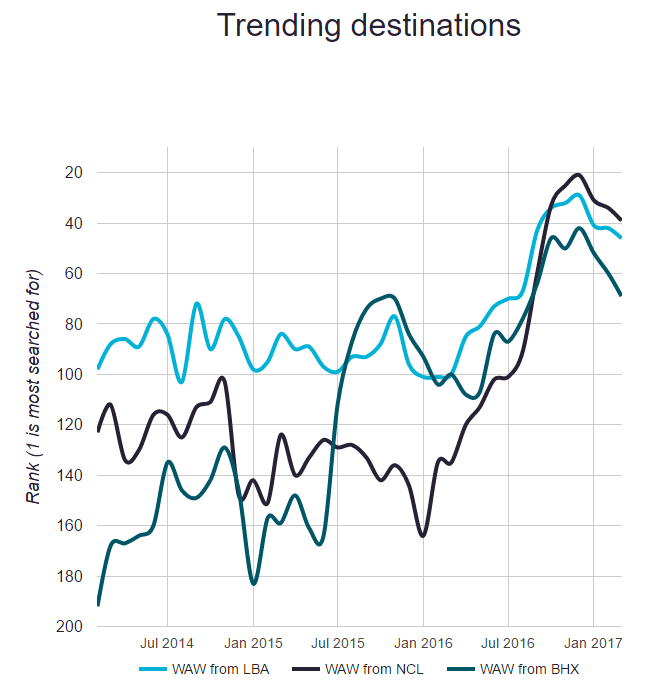 Popularity from Leeds-Bradford to Warsaw remained fairly steady between 2014-2016, but the destination took a major spike over the previous year jumping up from around 100th most popular city search to around 15th! Quite possibly, the Ryanair services from Leeds to Gdansk and Krakow raised visibility of the market and demand for a service to Warsaw was met with Ryanair starting operations to Warsaw Modlin Airport, 40km north of the city centre, in November last year. Meanwhile, the popularity of the city from Birmingham (BHX) has soared, elevating from around 190th in rank for popularity up to around 70th – a rise of 120 places! The two sharp increases in interest correspond, not surprisingly, to the arrival of Wizz Air in September 2015 and Czech Airlines from November 2016. Ukraine’s proud capital city plays a key part in the symbolism of the nation. Offering an outdoor haven, with lush greenery in abundance, it’s easy to see why this destination may appeal. 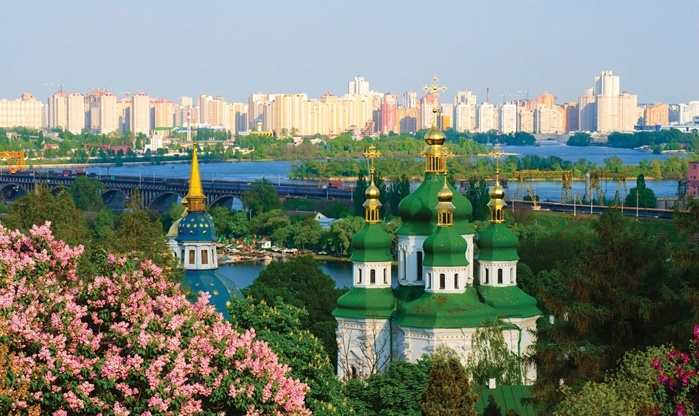 Whilst Kiev may not quite be at the dizzy heights of a top 50 trending destination, it is also seeing rises. The Ukrainian capital is gaining in popularity in Scandinavia, entering the top 100 searched for destinations in the middle of last year, while it’s trended up over 100 places in the space of two years from Dusseldorf. Perhaps if things keep trending in the way they are now, Kiev could soon be a major Eastern European tourist destination, showing lots of potential. 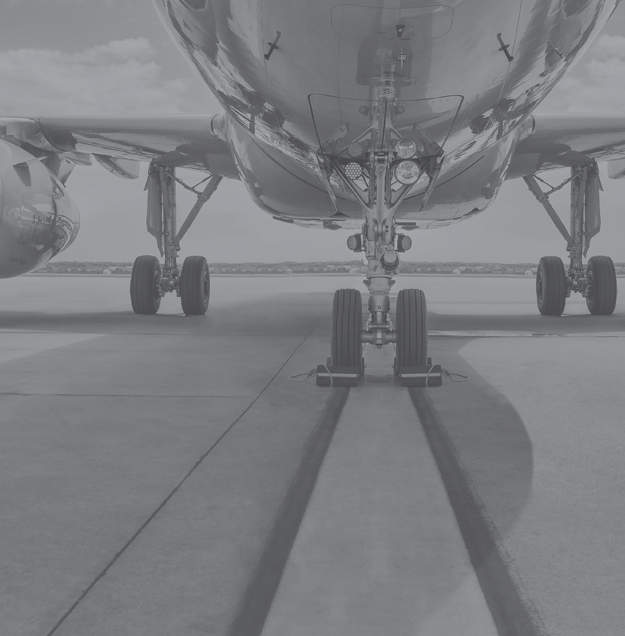 The arrival of Ryanair in October 2017, a move which was announced a month or two ago, will be a major stimulus to the market. New routes will include flights to Kiev from London, Stockholm and Manchester.